With futures up over 1.5% as I type pre-market, we’re seeing an unusually large gap up to start the year. 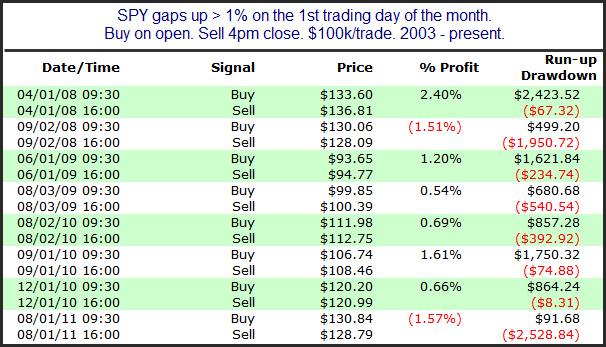 Below is a list of the 8 other instances since 2003 that SPY gapped up at least 1% to start the month. 8/2/10 was the only instance that gapped up as much as 1.5%. Looking out over next several days there was typically a pullback following day 1. None of the other instances started off the year. Evidence isn’t overly compelling, but we could see some add-on buying during the day today.